We are having trouble with the Add to SharePoint Sites functionality. It often doesn't work as we expect it to work. Hence I'll try to describe what we are doing, then I'll try to formulate my question. Thanks in advance for any help. 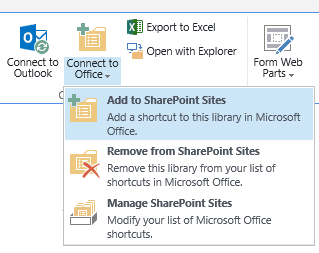 When you navigate to a document library, you can add it to your SharePoint Sites using the buttons located in the ribbon (Library -> Connect to Office -> Add to SharePoint Sites). All of these SharePoint Sites should then be available in an Open File/Save as Dialog in Office clients (Word, Excel, PowerPoint, etc.). In an ideal world, all of your links should be periodically synced, so that the folder "SharePoint Sites" in your file system for example under C:\Users\Administrator contains exactly the same links, as those displayed on the MyQuickLinks.aspx page. Our first issue is that we cannot reliably trigger the sync of these links. Several blog posts and forum posts suggest, that the links get synchronized once every 24 hours and / or that opening the Open File or Save As Dialogs in an Office Client will start the syncing. Once we open the "Save as" Dialog, the LinkPublishingTimestamp key is created in the Registry on our machine. We are also running a Fiddler in the background and checking for any calls to the publishedlinksservice.asmx but nothing happens. We have also made sure, that our AuthForwardServerList key contains all the correct addresses. All of our tests were done in a SharePoint 2013 environment, with clients running Windows 7 to Windows 10, even Windows Server 2008 R2 and Office 2000, 2013 and 2016. Is there any way to trigger the sync/update of the locally stored links to the SharePoint Sites? We tried deleting the LinkPublishingTimestamp key from the registry, then restarting the WebClient service and Excel, then going to a Save as dialog, but this didn't help. Several posts suggest, incompatibilities between 2010 and 2013 client and server products (example: using SharePoint 2013 and Office 2010) regarding this functionality. Do you have a complete reference about all the components involved in this functionality (WebClient Service, Office Clients, IE Add-Ons, etc.) and when and how all of these components are timed and executed? 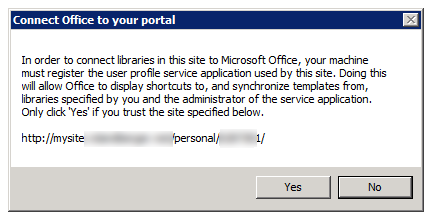 Office 2013 (also 2016) doesn't seem to display any links to the SharePoint Sites in the initial Save As page (where you can select between: SharePoint, OneDrive, Other Web Locations, Computer, Add a place). In order to access them, you need to navigate over Computer and the File System to your user account directory. Is this functionality even compatible with Office 2013 and upwards? Browse other questions tagged 2013 2010 sharepoint-enterprise sharepoint-server outlook or ask your own question.